A recent report by IM Practitioner – Insights into Integrative Medicine highlights the role of oral bacteria in gut health. Researchers Professor Hattori and Professor Kenya Honda of Keio University School of Medicine in Japan found that when the bacterium Klebsiella pneumoniae colonize the intestine “out of microbial balance,” T helper 1 (TH1) immune cells become overactive – leading to intestinal inflammation and onset of Inflammatory Bowel Disease (IBD). Klebsiella pneumoniae are normal residents of the oral cavity, they live in your mouth. In healthy individuals, they cause no problem. They are considered opportunistic pathogens they don’t cause health problems unless the opportunity arises, ie when immune system response is overwhelmed or slow to respond, or environmental conditions are ripe. When gut flora is out of balance, Klebsiella pneumoniae move in. When Klebsiella pneumoniae bacteria colonize susceptible respiratory tissues in the lungs, they cause pneumonia. Klebsiella pneumoniae are implicated a spectrum of diagnoses including pneumonia, bacteremia, thrombophlebitis, urinary tract infection (UTI), cholecystitis, diarrhea, upper respiratory tract infection, wound infection, osteomyelitis, and meningitis. The precursor to a gut that is “out of microbial balance” is the recurring or long term use of antibiotics, including commonly prescribed ampicillin, a penicillin-like antibiotic used to treat pneumonia; bronchitis; and ear, lung, skin, and urinary tract infections. 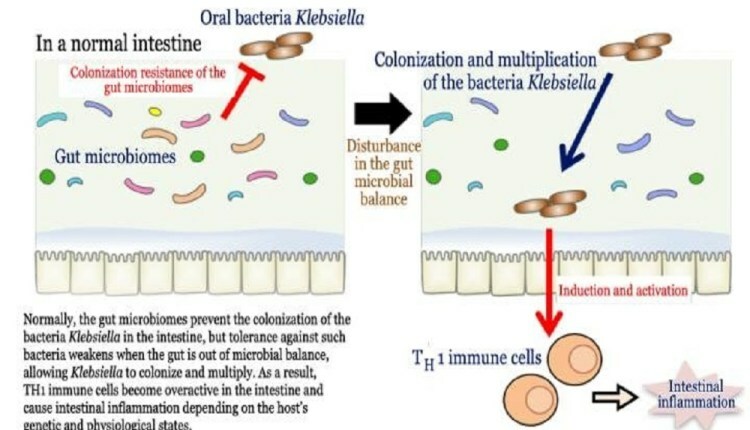 When antibiotics disturb the balance of the gut microbiome, Klebsiella pneumoniae can colonize the gut and increase in population, causing the immune system TH1 response. In the gut, when left unchecked and colonies grow, intestinal inflammation and IBD may result. A gut “out of balance” allows colonization by the bacteria Klebsiella, and a cascade immune response which may underpin IBD and gut health. Microdose with probiotics. Enjoy digestive takram (cultured unpasteurized buttermilk to which digestive herbs such as cumin or cinnamon may be added) after meals. Daily doses of small quantities (2-4 oz) of takram, kefir, or dilute high-quality live-strain cultured yogurt is beneficial to maintaining a healthy balance of gut flora and digestive health. This prevents invasive species such as Klebsiella pneumoniae from setting up shop in the gut, maintaining microbe harmony and healthy digestion, or what Ayurveda refers to as balanced agni. Gandusha, or gandoosha, is commonly referred to as oil-pulling. Fill the mouth and holding oil in the mouth for no more than five minutes. This is a common oral hygiene practice recommended by Ayurvedic practitioners. Common sesame oil can be used with excellent results for this purpose. Coconut oil is popular for its flavor and mouth feel. Ayurveda recommends Sesame oil in the winter and spring season, and Coconut oil in summer and autumn due to their opposite energies: Sesame oil is heating (ushna virya) while Coconut oil is cooling (sheeta virya) – you can feel the difference in your mouth. Additionally, dental oil can be medicated with vishagnha (poison destroying) and krummighna (antimicrobial) herbs to target and heal jaw and mouth injury, gum infection, and chronic sinus infection (which requires the local use of medicated oil called nasya in the nasal passages). Note that oil pulling should not be used daily for longer than 2 weeks. For general purposes oil pull twice a week to maintain healthy oral microbe balance and oral health. As our friend at the excellent blog trueayurveda.com points out, Charaka Samhita in Ayurveda was the first to explain the connection between the Ears, Nose, and Throat in medicine. While the IM Practitioner post downplays the role of oral hygiene in gut health and colonization by opportunistic Klebsiella pneumoniae, Ayurveda has long recognized that cleanliness of the senses and their associated organs contributes to overall health in profound ways. For individual recommendations, and to obtain Roots of Wellness Dental Oil with important and clinically proven broad-spectrum anti-microbial and wound healing compounds extracted from Guduchi Tinospora cordifolia, Neem Azadirachta indica, Turmeric Curcuma longa, and other important Ayurvedic herbs**, schedule a consult with one of our Ayurvedic Practitioners or Ayurvedic Doctors today.